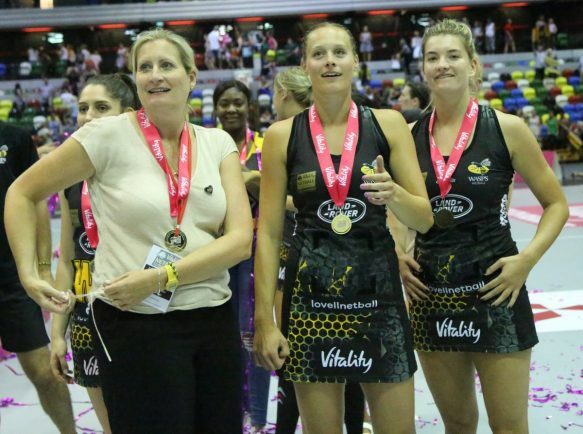 STAR defenders Fran Williams and Josie Huckle will don black-and-gold again next season as Wasps Netball seek to defend their Superleague crown. The pair join fellow defensive stalwarts Hannah Knights and Sam May in signing on for the new season. Williams has recently been selected to the England Roses programme for the first time and is tipped to be a future star of the national side. The 20-year-old made numerous appearances from the bench for Wasps in 2018 and is targeting a starting role next year. Williams said: “It’s a very exciting time for me and the next season will be a huge one, both with Wasps and being part of the Roses programme. “I’m still developing as a player and I have loved my time at Wasps so far – the next step for me will be to have more time on court and a consistent starting role. “I’m looking forward to working closely with Mel too. Huckle was a starter in the 2017 Grand Final and also made key contributions from the bench last season. The goal keeper has since started to work with the under-17 set-up at Wasps, taking her first steps into coaching aged 26, but is targeting having a big impact as a player in 2019. “It’s like a family at Wasps and after some good conversations with Mel, I decided this was the perfect place for me to be,” said Huckle. “She was very honest with me, very organised and thinks how I think – it will be good to play under her next season. “We have massively grown as a team over the last three years and we’re focused on defending our title. “I’ve won four Superleagues in a row now and I intend to make it five. Wasps head coach Mel Mansfield added: “This defensive duo are back for season number three and I couldn’t be happier. “Fran is now in the full time England Roses programme and made huge progress last season, gaining considerable court-time with our more experienced players. “I look forward to progressing Fran’s game further and working closely with her. “Josie is also back for a third season and keeping our experienced defensive line-up the same gives us a head start. “They both offer such variety. Josie had a big impact last season in critical moments and brings so much to the team.